Spring is a popular time to consider making a move. Debbie Amoroso found her move to the Masonic Village at Lafayette Hill to be a perfectly-timed decision, as well as a freeing and fulfilling experience. Packing a lifetime of belongings into a smaller home requires some effort, but in the end, living simpler creates more time for the important things in life: family, friends and freedom. The term “downsize” carries a lot of weight, especially for someone considering a move to a retirement community. Packing a lifetime of belongings into a smaller home requires some effort, but in the end, living simpler creates more time for the important things in life: family, friends and freedom. After working with staff at the Masonic Village at Lafayette Hill, located outside Philadelphia in Montgomery County, Amoroso’s downsizing fears quickly dissipated. She used her apartment’s floor plan to determine which furniture would fit and kept the items she used most. Her children chose what they wanted to keep, and she even purchased new items to fit her modern, yet homey style. Harris’ advice to new residents includes purchasing organizational containers that can fit on tall shelves, which would normally be unused, or underneath beds to save space. Buying additional shelving for closets can also allow for creativity. She has seen a few residents turn their walk-in closet into a home office. Rochelle Welkowitz, a real estate professional who specializes in serving the unique needs of the active adult and senior community, encourages older adults to embrace the transition. “Take all the brand new things you’ve been saving – the fancy nightgown, the new sheets, the gourmet jelly, the cashmere gloves – whatever it is that you have had for years but have not used because it was too good – and start using it,” she said. Room to stow trinkets and items she’ll never use again seems less important now to Amoroso now that she is active with Masonic Village’s theater club, volunteering and dining with friends. The lights of her life, her two young grandchildren, visit a few times a month. 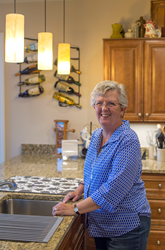 As her family dines and toasts together at her breakfast bar, Amoroso smiles and knows she made the right choice in selecting her apartment. “I’ve got the perfect amount of space for me and my favorite possessions, including my little balls of energy,” she said.